A beginner paddles his surfboard out into Hainan Island’s warm waters wearing white gloves, a mask and snorkel. Another has his board back-to-front, while a woman wants to wear her leg rope like a dog collar. 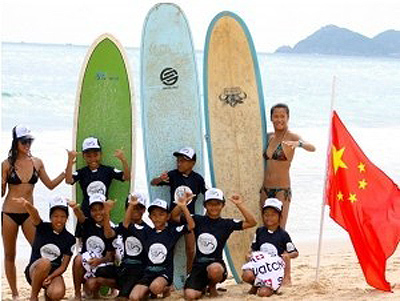 "A lot has happened in those 12 months," Darci Liu, the first Chinese surfer to compete in a pro event when the world longboard title was held on Hainan in 2011, told Reuters. "We did not know if it was real or not. Maybe no one would care. But there really is interest, even more than I expected. "It is just so different to Chinese people," the former ballerina added. "We grow up thinking the ocean is something to be scared of, but people are seeing it can be enjoyed." The ASP’s 2011 debut in China attracted worldwide headlines. Liu was profiled by CNN and the New York Times, perfectly scripted in her role of "dancing across the South China Sea". "This is just the beginning. No one surfed a couple of years ago but now I think Chinese people are starting to see they don’t have to be terrified of the sea," Liu added. "It is a place to respect and enjoy. We can play out there. People have started coming from the mainland, asking us: ‘Can you show us how to surf?’ I hope in my lifetime that I see a Chinese surfer as a world champion. I think I will." "The first event was big news on Hainan Island and elsewhere in China but not many people knew about surfing," he said through a translator. "Now they have seen it happening in Chinese waters and the fascination is here with us. With surfing still being a new sport, we have uncrowded and unspoilt coastline for miles. "I have enjoyed watching the Hawaiians and the local Chinese wildcard, Darci. I should get some lessons from the girls, though, before I go in the water. I can use all the help with surfing I can get." "Being involved in a sport that is young to the Chinese people when to us, it has been around forever, that’s blowing my mind," she said. "When I was growing up, surfing was all about the adventure, finding new places, meeting new people, and that’s what we’re doing here. There’s a bunch of kids surfing now and it’s like watching a new seed being sprouted. It’s starting to dawn on us all that it’s real."